Farming is one of humanity’s oldest professions, right after hunting and gathering. But now, a startup called Iron Ox is in the process of opening a farm in California that will replace human farmers with robots. At the heart of Iron Ox’s operations is Angus, a robot that uses its dexterous arm to tend to mattress-sized hydroponic beds of edible plants. The bot’s machine learning software allows it to identify and remove plants exhibiting signs of pests or disease before they can infect the whole patch. Iron Ox’s goal seems to be disrupting the current model of industrial agriculture. The company’s founder, Brandon Alexander, appears particularly well-suited to take on the task: He previously worked as both a farmer and a Google engineer. If all goes well, Iron Ox plans to uproot farming norms with a series of robotic farms that sell locally-grown greens, from lettuce to basil, to restaurants and grocery stores across the country. 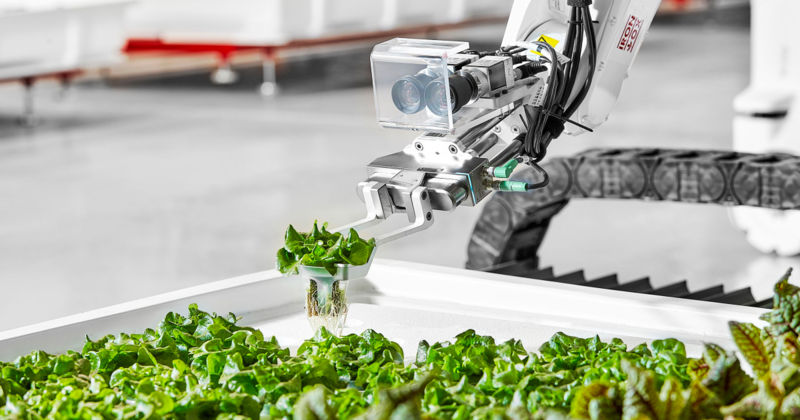 Though it hasn’t inked any deals yet, the startup says it’s already in talks with Bay Area restaurants, and Alexander told a local news station in San Francisco that the company hopes to be selling robot-grown produce in grocery stores by 2019. Eventually, he told Fast Company, the goal is to grow produce at a lower price than conventional farms. If the company can pull that off — which, granted, is a huge “if” — it’ll radically reorient the relationship between farmers, food retailers, and, ultimately, your dinner plate.